What is a Holographic Overlay? Holographic overlays protect ID cards from abrasions and enhance security by preventing alteration and duplication. Overlays are available in full spectrum holographic design and clear non-holographic protective finishes. Full spectrum ID hologram images can only be seen at certain viewing angles, which allow visibility of the underlying ID card information which differs from UV ID holograms. Each overlay is 2 mm thick, and is applied to the ID card following the lamination process. Overlays are applied manually by hand in a peel and stick format. 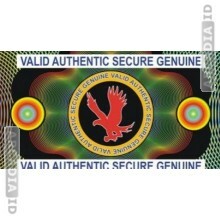 Buy 25 Authentic Eagle Holograms and get 10 Free!